The V-Reds will host the Providence College Friars on Jan 1st and Jan 2nd for the annual Pete Kelly Cup. The V-Reds have won the previous four Cups, losing the inaugral cup to SMU in 2005-06. The last time the V-Reds played the Friars was last season when they bested the Friars 6-3 down in Providence, outshooting the Friars 39-19. Scoring for UNB on that occassion were Josh Hepditch, Lachlan MacIntosh, John Scott Dickson, Josh Kidd, Daine Todd, and Hunter Tremblay. The Friars are 7-6-5 this season in the NCAA. They have a powerful PK, allowing only one goal in 26 PP by their opponents. The top scorers for the Providence College are Kyle MacKinnon and Ian O'Connor, with 15 points each in 18 games. The games can be viewed on the SSN website, and will be live blogged on the CISBlog website. Former V-Red Darryl Boyce was called up to the Toronto Maple Leafs on Thursday and managed to record his first NHL point by getting the assist on the first Leafs goal of the game against Columbus. Congratulations to Darryl Boyce on his fantastic night! V-Reds get to Redmen early and cruise to win UNB 7 - McGill 1 FREDERICTON ? 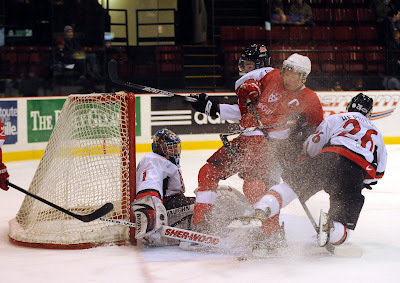 The much anticipated exhibition game Thursday night between the OUA East leading McGill Redmen and AUS leading University of New Brunswick Varsity Reds was somewhat anticlimactic, as the #2 ranked V-Reds jumped out to an early lead on the #3 ranked Redmen and cruised to a decisive 7-1 win. UNB got off to a great start, scoring on their first shot of the game when after some good offensive pressure Nick Layton (Salisbury, NB) scored on UdeM goaltender Hubert Morin (St. George de Beauce, QC) just 1:15 into the game. Less than a minute later, after offsetting coincidental minor penalties were called, UNB scored just one second into the four-on-four play when Kyle Bailey (Ponoka, AB) won the faceoff in the McGill zone back to Lachlan MacIntosh (Perth Andover, NB) who one-timed the puck past a surprised Morin. Shortly after, at 3:42, Layton scored a highlight reel goal when he came down the right side, undressed a McGill defenceman, and wheeled into the slot where he beat Morin with a wrister for his second goal of the game. UNB stretched their lead to 4-0 at 7:27 when Hunter Tremblay (Timmins, ON) found some open space on the right side on a rush, and then fed a perfect pass to Jordan Clendenning (Fredericton, NB) in the slot for the one-timer that Morin had little chance on. With the offensive flurry, the game was effectively over as some fans were still finding their ways to their seats at the Aitken University Centre. McGill's best scoring chance in the period came late in the period when Alexandre Picard-Hooper (Boucherville, QC) made a good shot but UNB's Travis Fullerton (Riverview, NB) made a better save. This was followed shortly after by a Tremblay shorthanded breakaway. Shots on goal favoured UNB 17-4 in the first period. The game settled down in the second period, although UNB had the edge in territorial play. There was no scoring until 11:56, when UNB scored on their fifth power play of the game, when Hunter Tremblay fed the puck to Kyle Bailey for the one-timer. The shots in the second period were even, with eight apiece, but McGill wasn't able to generate any sustained pressure, nor support on the rush. The third period was a bit chippier than the first two periods, and McGill continued to struggle to find time and space to get their offence going. The first half of the third period didn't have a ton of scoring chances, but UNB took advantage of a five-on-three man advantage when Bretton Stamler (Edmonton, AB) wired a point shot to score at 12:04. Francis Verrault-Paul (Mashteuiatsh, QC), the leading scorer in the CIS, came out of the penalty box and scored on a breakaway as he crashed the net at 13:49. However he left the game after the goal and went to the McGill dressing room in obvious distress. UNB closed out the scoring at 18:07 when MacIntosh tapped in the rebound after Morin made a pad save on Dion Campbell (Melville, SK). Shots were 32-15 for UNB in game. The V-Reds were 2 for 8 on the power play while McGill was 0 for 3. The three stars of the game were: #1 Nick Layton, #2 Jonathan Harty, #3 Nicolas Biniek. Attendance was 2278. For McGill head coach Kelly Nobes, it was pretty obvious his team didn't get off to a good start. ?We were on our heels to start and didn't respond well to UNB. There haven't been too many games when we had to play without the puck. It is a good lesson and we'll learn from it.? The Redmen were coming off a great third period against StFX the night before in Antigonish, NS, where they erased a three-goal deficit only to lose 6-5 in overtime to the X-Men. UNB head coach Gardiner MacDougall knew his team would be fresh, having not played since December 3. "We were excited to play tonight against a good opponent. It was a long break, and the stress of exams for the players, so the players were ready to go." As for the fine play of Nick Layton, "we expected a lot from Layton based on his success in Junior, and he played a strong two-way game tonight. We need contributions from guys like him if we're going to be successful." Next up for the Varsity Reds is the 6th annual Pete Kelly Cup on January 1st and 2nd when the NCAA's Providence Friars make their first ever visit to the AUC. Notes: Defenceman Josh Kidd was back in the UNB line-up, but Luke Gallant, Jeff Lee, Daine Todd, Taylor Procyshen and Ben Shutron are still on the injury list. Former V-Red Darryl Boyce was called up to the Toronto Maple Leafs tonight and earned his first NHL point, assisting on the first goal of the game against Columbus. He wore the same #47 that he wore at UNB. Just a quick note to pass along - since there will be no radio or web video coverage of tonight's game vs McGill, those of you who can't make it to the Aitken Centre can follow David Kilfoil's liveblog over at the CISBlog. The holiday break is about to end for the V-Reds. They'll be hitting the ice soon to prepare for their next game against the OUA leading McGill Redmen Thursday night at the Aitken Centre. McGill will be coming in with just one game under their belts after bad weather cancelled a second scheduled game vs. STFX in Nova Scotia, but they will still be playing STFX tonight in Antigonish to work off the Christmas rust. Bill Hunt writes about the interesting case of Steve Pearce playing his former teammates in today's Daily Gleaner. Keeping with the holiday season, former V-Reds captain Dustin Friesen was helping spread some cheer around last week with his Bridgeport Sound Tigers teammates at Bridgeport Hospital. (thanks to Dan for the link). In today's Daily Gleaner, Bill Hunt catches up with Tim Army, head coach of the Providence College Friars team that will visit UNB on January 1st and 2nd for the Pete Kelly Tournament. Hunt gets Army to talk a bit about his rebuilding Friars team and how UNB would do in the ultra-competitve NCAA Hockey East. With Santa Claus no doubt making last minute preparations, we at UNBHockeyFans.com would like to wish everyone a Merry Christmas and/or a happy holiday season. Drive safe, watch lots of hockey and hopefully Santa finds you. With 6 pretty good players out of the lineup due to injuries, the mid-season break couldn't come soon enough for the Varsity Reds. Fortunately, it's looking like the team's luck has improved. In today's Daily Gleaner, Bill Hunt writes about the expected return of Luke Gallant, Jeff Lee, and Josh Kidd to the lineup sometime during the three exhibition games scheduled over the break. Fans remain optimistic that Ben Shutron will make it back in time for the playoffs, which would see UNB potentially adding two of the team's conference's nation's top scoring defencemen to the lineup. Switching gears, don't forget that your season tickets won't get you into the Pete Kelly tournament games vs. Providence, so you'll have to buy a ticket for this special series. Good news is that buying a ticket to both games earns you a free ticket to the McGill game as well! Sparks vs. MacLean. Cavanagh vs. Zanutto. Carroll vs. Leblanc. Fans can now vote for the 1990's All-Decade team and there's sure to be some heated debate since a lot of you fans were regulars during this era. You must pick 3 forwards, 2 defencemen and 1 goalie. You may vote 3 times per week. Voting will run until February 6th. Here's your chance to pay your respects to your favorite UNB hockey players from the 1990's so make sure you get your picks in! We're happy to pass along that the Varsity Reds hockey team is launching "V-Red Nation", a free e-newsletter that will be sent to your inbox twice weekly. The first edition is scheduled to be delivered sometime tomorrow. V-Red Nation will bring news about the UNB hockey program, the V-Reds Prospects, and news about the upcoming University Cup straight to your inbox. Sign up here, fill out a few bits of information and join the V-Red Nation. Today's Daily Gleaner reveals the results of fan voting for the 1960's All-Decade Team. Forwards selected include Marty Winslow, Darrell LeBlanc, Richard Clark, David Peterson, Herb Madill, and Ron Andrea. On defence, Jack Drover, Don MacIntyre, Don Wells, and Ken Marchant. In goal, Keith Lelievre and Dave Inch were selected. The article cites honourable mentions going to Karl Parks, Austin Duquette, Ed Grant, Bob Naylor, Ian Lutes and David Wisener. For complete details you can read the article here. The 70's, 80's, 90's and 2000's are yet to be determined in what is turning out to be a fun and engaging process for the fans, and a great way to pay tribute to the UNB teams of the past. The final tabs of first semester are in, and AUS Fan will sit on top of the AUS hockey pool mountain for the remainder of 2010. Boasting 177 points, he has taken the lead from Jack Gillis and hopes to carry that momentum into 2011. This week's top performer was once again "Todd's Shoulder", who is rapidly climbing up the ladder. As we wind down for the holiday season, keep in mind the pool's trade deadline is December 31st, 2010. Take a look at your totals. If you think we've made an error, we probably have. Kindly send us an e-mail and we'll look into it. For the third time this term, Hunter Tremblay was given the nod as male athlete of the week. Tremblay's assist on the Clendenning goal in the 4-0 victory over UdeM put his name on top of the regular season points record book in UNB Men's hockey history. The record sitting out in front of him now is the career mark that sits 19 points away. To follow his progress in the career points race, you can keep watching this link. For a look at Hunter's numbers, and the other records of past players, head over to the amazing pages put together by Eric & company here. For a quick summary of Hunter's place in some of the record races, take a look here. With the end of the first term, student athletes are currently busy writing exams and the CIS has released the last Top Ten of 2010. UNB has returned to the #2 spot, SMU remains 5th and UPEI has moved up to 6th. Dec. 30th will see a lot of National attention on the Aitken Center as #3 McGill comes to visit the #2 V-Reds. Here's how the rankings look in the seventh media poll. Other teams receiving votes: Calgary (11), St.Fx (5), Waterloo (5), Wilfrid Laurier (1). In today's Daily Gleaner, Bruce Hallihan takes a look back at the first half of the AUS season and manages to get a few words from Coach MacDougall. No real surprise, the impact of long-term injuries to some key players are mentioned. With that, we'd like to hear your thoughts on the first half. Injuries have dominated the news at UNB but there's been a few positives. This year's goaltending duo seems to have taken a step forward from last season, Chris Culligan has taken his game to another level, and guys like Dion Campbell and Josh Hepditch have stepped into bigger roles on the team. How would you rate the first half and what do you think the team needs to focus on moving forward? Edit: And for those who missed it, there's a short video of the play that lead to Hunter Tremblay's points record. FREDERICTON -- The game Friday night between the UNB Varsity Reds and the UdeM Aigles Bleus went two periods without a goal, but everything came together for the large, restless, partizan crowd in the dramatic third period when Dion Campbell (Melville, SK) finally solved P.-A. Marion (Gatineau, QC) to open the scoring at 7:17 and Hunter Tremblay (Timmins, ON) capped the offensive explosion five minutes later by setting up Jordan Clendenning (Fredericton, NB) for the final goal of the game in the 4-0 victory. Tremblay, the CIS MVP last season, had been held pointless the last two games, and his pass that Clendenning one-timed past Marion earned him his 178th career regular season point, establishing a new UNB record. The old record was held by Tremblay's linemate his first year at UNB, Rob Hennigar, who went on to also win the CIS MVP honour, plus the BLG Award in 2008. Tremblay was much happier about the two points for his team rather than the one point for him. "I was thinking that we had a two-game slide last weekend and I didn't want to go a whole entire month on a losing streak and once the floodgates opened I thought we could get it done tonight." "It" being the UNB points record that has been perhaps weighing on him a bit. For 47 minutes the game was deadlocked, with UdeM goalie Marion making 30 saves to that point to keep the game scoreless. Then defencemen Spencer Corcoran (Summerside, PEI) carried the puck into the Moncton zone and threaded a pass to a streaking Campbell who split the Moncton defence and deked out Marion. Just over a minute later Corcoran found himself on the other side of the ice along the goal line and "it was a delayed penalty and I saw he [Marion] was cheating over and didn't think I was going to come to the net so I just pushed it toward the net" and the puck bounced off Marion's right pad and past him. The goal was Corcoran's first as a V-Red in AUS conference play. The next goal came just over two minutes later on the power play when fellow defenceman Ben Wright (Foremost, AB) was all alone on the left circle, and had enough time to settle down a wobbly puck before snapping it into the top corner as Marion was still coming across his crease. With a now comfortable lead, the stage was now set for a relieved Tremblay to set his UNB record two minutes later on the Clendenning power play goal. V-Reds head coach Gardiner MacDougall then used his timeout so that Tremblay could get a well deserved ovation from the more than 3600 fans at the Aitken University Centre, the majority of them school children, plus receive a record recognition plaque at centre ice from UNB Athletic Director Kevin Dickie. For MacDougall it was a special night and a great advertisement of CIS hockey. "It was a great environment, and the kids add such excitement, they were our seventh man tonight." Twice a season the V-Reds have a promotional night for schools in the Fredericton area that fill the stands. For Tremblay, "I love it, it's like being back in Junior or in a pro game." Speaking of Tremblay, coach MacDougall was happy to see him get his accolades from the crowd (and on live television). "He deserves it. He had a couple of shots earlier in the game that didn't go in and he set up his teammates several times. Like last weekend, sometimes they just don't go in." For Moncton coach Serge Bourgeois, "Hunter Tremblay is the best player in the AUS and we had played him tough two previous games this season, but couldn't stop him this time." Almost lost in the excitement was the fine play of UNB goaltender Travis Fullerton (Riverview, NB). While not near as busy as Marion (Moncton was only credited with 11 shots on net, while UNB had 42) he did have to make several key saves, and the shutout is Fullerton's third of the season to lead the AUS. The Varsity Reds go into the exam and Christmas break still in first place in the AUS with a record of 11-4-0 while les Aigles Bleus drop their fifth in a row and sit in seventh place with a 5-8-2 record. Next up for UNB will be the visiting McGill Redmen on December 30th, and then they host the NCAA's Providence College Friars on January 1st and 2nd for the annual Pete Kelly Cup Challenge. The V-Reds return to conference play when they host the Dalhousie Tigers on January 7th. Goals by Dion Campbell, Spencer Corcoran, Ben Wright and Jordan Clendenning would provide all the offence needed to beat Moncton by a 4-0 margin. Travis Fullerton picked up his league leading third shutout of the season, stopping 11 shots, including a few acrobatic saves. The story on this night will be the assist on the Clendenning goal by one Hunter Tremblay. With that point, Tremblay takes over sole possession of first place on the all-time UNB regular season points list, passing former teammate, Rob Hennigar. Congrats, Hunter! The V-Reds will head into the break in first place in the AUS with 22 points at 11-4. The next game will be vs. McGill on December 30th. Final regular season game of 2010, TONIGHT! Tonight, the AUS #1 ranked V-Reds (10-4-0) host the AUS #7 Aigles Bleus (5-7-2) at 7pm at the AUC. The V-Reds, on a two game losing streak, will look to end the 2010 regular season with a win, while the Aigles Bleus will look to hault a four game losing streak. The V-Reds suffered their first back-to-back weekend loss since Nov. 1-2 of 2008 over the past weekend. But that was last weekend. Tonight the V-Reds will look to returning to their winning ways and to continue their quest fo the University Cup. Once again Hunter Tremblay will look to get that one point that will move into sole possession of first place for regular season points in the history of UNB. For his points comparison to Rob Hennigar, you can look here. The Aigles Bleus have not been having a great season, and with a road record of 1-6-0, they will look to end 2010 with a win as they begin a long almost six week break without a game. The Aigles Bleus are led in scoring by Dean Ouellet and Kevin Charland with 15 and 12 points respectively. Bruce Hallihan gives perspective to tonight's game in the Daily Gleaner here; while the Times Transcript offers UdeM's perspective on tonights game here. The game can be seen as a webcast from the SSN network, watched on Rogers TV, listened to on CHSR radio, and followed on UNBHockey on Twitter. The half-way point of the 2010-2011 season has been reached, and Jack Gillis leads the AUS pool on the strength of 53 goals and 155 points. Both Brandon and Todd's Shoulder had big weeks capturing 20 points. Needless to say, it was a rough week for all the poolies who were UNB heavy with their picks. The top 10 list is below. Lots of people are still in this race. The complete pool results are available at the AUS pool page. Take a look at your results, if you think we've made a mistake, send us an e-mail and we'll look into it. With seven weeks complete in the AUS, the CIS has released the seventh Top 10 Rankings of the year. UNB has moved back down to the third spot with two weekend losses. UPEI has fallen down to seventh, while Saint Mary's has moved up to fifth. Other teams receiving votes: Calgary (20), Acadia (11), Dalhousie (2), Carleton (1). The full story can be found here. There's no sugar coating this one. The Tigers delivered a beating to the V-Reds that they haven't felt in some time at Dalhousie. The win-streak vs. Dalhousie ends at 14 games. Final score was 6-3 for the Tigers. Derek Yeomans started the game, was replaced, and eventually returned in goal for UNB. Bobby Nadeau stopped an amazing 52 of 55 shots to secure the win for the Tigers. For those keeping tabs, UNB got goals from Bailey, Culligan, and Hepditch. Dalhousie had a productive weekend, beating the top 2 teams in the conference on home ice and scoring 12 goals in the process. UNB is limping home after its worst road trip in a very long time. The AUS standings are getting interesting as the top 6 teams are separated by a mere 5 points. UNB has one more game before the break, this Friday vs. UdeM. V-Reds @ Tigers 7pm tonight! The AUS #1 ranked V-Reds (10-3-0) do battle in Halifax tonight at the Dalhousie Arena against the AUS #6 ranked DAL Tigers (7-6-0) at 7pm. The V-Reds have beat the Tigers their last 14 meetings, and will look to carry on this steak tonight. The V-Reds, coming off their third loss of the season last night to Acadia (6-5-2), will look to reverse their fortunes tonight and to maintain their lead over the AUS #2 UPEI Panthers (8-3-2) who are only two points back. The V-Reds are led in scoring by Hunter Tremblay and Chris Culligan with 20 and 18 points respectively. Tremblay will be once again looking to get that extra point that will propel him into sole possession of first place in regular season points in the history of UNB hockey. The Tigers come into the game on a three game winning streak where they have shown that they can grit it out and win big games. Their last three games, all overtime victories, were against the AUS #5 ranked Axemen, the #3 ranked Huskies, and last night against the #2 ranked Panthers. DAL will come into this game looking to prove they can beat anyone. The Tigers are lead in scoring by Benjamin Breault and Brad McConnell with 14 and 12 points respectively. The game can be viewed as a webcast on the SSN network and can be followed on UNBHockey on Twitter. Last night's loss to Acadia ended a winning streak against the Axemen that dated back to January 20th of 2007 when Reg Bourcier was the goalie of record. Acadia went more than 3 full seasons, including 13 regular season games and 3 playoff games without beating UNB, so maybe this one was long overdue. Take a look at Acadia's roster on the AUS stats page here. Looks like this was the first win vs. UNB for the entire team. It's definitely game on in the AUS as the race looks to be the tightest it's been since the 2006-2007 season. The Acadia Axemen were 3-2 winners on home ice against the V-Reds Friday night. UNB got goals from Bailey and MacNeil but couldn't score more than twice. Travis Fullerton took the loss in net. UNB will hold on to first place in the AUS for the time being with their 10-3 record. There's no time for dwelling on this loss, as the team will look to rebound when they visit the Dalhousie Tigers tomorrow night in Halifax. The AUS #1 ranked V-Reds (10-2-0) travel to Wolfville tonight to do battle at the Acadia Arena versus the AUS #6 ranked Axemen (5-5-2) at 7pm. The V-Reds have won the last 16 contests between these two teams, including a 5-2 victory earlier this season. Most V-Reds fans will follow this game to see if Hunter Tremblay can rewrite the record books. Tremblay is now tied with Rob Hennigar for first place all-time in regular season points (177) and will look to continue the momentum he gained in the last outing against STU where he scored a hat trick in the 4-0 victory. The V-Reds are led in points by Hunter Tremblay and Chris Culligan with 20 and 18 points respectively. The Axemen are on a three game losing streak, including a loss to Dalhousie last weekend 4-3 in overtime, and will look to reverse their fortunes on home ice. Acadia has the best power-play in the AUS, with a .262 percentage to the second place V-Reds' .214. The Axemen are led in points by Chris Bruton and Jonathan Laberge who each have 16 points. The game is available as a webcast from the SSN website and can be followed on UNBHockey on Twitter. Former V-Reds captain Dustin Friesen suited up for the AHL's Bridgeport Sound Tigers last night and managed to make the scoresheet by recording 4 minutes in penalties. Bridgeport lost the game 2-1 in overtime to the Providence Bruins. Earlier yesterday Bridgeport signed Friesen to a Professional Tryout contract. We're almost at the half-way point of the season and it's still wide open. The complete results can be viewed by clicking the AUS Pool link on the right sidebar. As always, if you think you see an error in the totals, send us an e-mail and we'll look into it. Three guesses as to who earned this week's UNB/Valley Graphics Male Athlete of the Week award - the hat trick against STU grabbed enough attention for Hunter Tremblay to receive that honour. Incidentally, this is the second time this season Tremblay has received the award. Speaking of Tremblay, pick up a copy of today's Daily Gleaner to read David Ritchie's article about the quiet and unassuming #7 and his value to the team. With six weeks complete in the AUS, the CIS has released the sixth Top 10 Rankings of the year. UNB has moved up one spot to #2 as McGill suffered their first loss of the year. UPEI has jumped up to fifth nationally, while Saint Mary's has dropped down to eighth. Here's how the rankings look in the sixth media poll. Other teams receiving votes: UQTR (21), StFX (9), Walterloo (5), Carleton (3), Concordia (1), Guelph (1). The Daily Gleaner's Chris Fox gets a few words in with former V-Reds forward Darryl Boyce. Boyce of course is playing for the Marlies in Toronto, still chasing his dream of making it back to the NHL after his first stint ended abruptly with a season ending injury. Boyce is fairly honest in the article, and at one point says "I'm going to be made out of metal, staples and wire eventually," reflecting on the life of a pro-hockey player who has had his share of injuries. Perhaps most importantly, he's still progressing towards his degree while working full-time in an extremely demanding profession. David Ritchie's article in today's Daily Gleaner nicely summarizes how the afternoon went for Hunter Tremblay yesteday. He even manages to get a few words out of Tremblay after the game. Mr. Ritchie also points out that the Battle of the Hill has gone in favour of the good guys 24 straight times, we'll leave it to the historians out there to see how that streak holds up against other UNB streaks, and perhaps other CIS teams. The Varsity Reds might not have played a great 60 minutes, but they played well enough Sunday afternoon to blank the St. Thomas Tommies 4-0, thanks in no small part to the hat trick of Hunter Tremblay (Timmins, ON). While Travis Fullerton (Riverview, NB) got the shutout for UNB, at the other end of the ice STU netminder Charles Lavigne (St. Bernardin, ON) did his best to keep his team in the game, making 36 saves and putting on a show for the 2302 fans at the Aitken University Centre in the losing effort. While the early play favoured the V-Reds, at 6:25 power forward Jeff Lee (Calgary, AB) had to leave the game with a leg injury, and didn't return from the locker room. 15 seconds later Jordan Clendenning (Fredericton, NB) rang a shot off the crossbar behind Lavigne, the first of four times that UNB would clang the iron in the game. At 8:11, after several saves, Lavigne was finally beat by Tremblay, who had been held pointless his last two games. Seven minutes later Tremblay got past STU captain Erick Tremblay on a two-on-one rush, but Lavigne anticipated the pass well and made a great save coming across on Chris Culligan (Howie Center, NS). UNB kept the pressure on, with Nick Layton (Salisbury, NB) hitting the crossbar about a minute later, and then, in the last minute of the period, Lavigne made saves on both Tremblay and Clendenning in close. Shot in the first period were 16-4 for UNB. The second period started off with a bang when Kyle Bailey (Ponoka, AB) drilled a puck from the slot that hit Lavigne square in the face mask, but the STU netminder shook it off. However as the period rolled along the Tommies were playing a close-checking road game for the most part and the V-Reds started to get away from their normal high tempo attack, and at times were fortunate that the STU forwards weren't converting their opportunities. UNB head coach Gardiner MacDougall used his timeout at 5:10 which he later acknowledged was to renew his team's focus and get them to stop "playing shinny". UNB was on the power play at 8:34 when STU's Scott Judson (Riverview, NB) was assessed a double-minor for high-sticking Jonathan Harty (Oromocto, NB). UNB did not produce many scoring chances on the 1:23 of five-on-three play, nor for the remainder of the Judson penalty for that matter. The excitement came in the last minute of the period. Two Tommies tried to stand up Bailey in the neutral zone and that created an opening for Nick MacNeil (Creignish, NS) to break in alone on Lavigne who was forced to make a big save. Seconds later MacNeil had the puck back and rang a shot off the post. UNB managed to get a line change in during this attack and it was Luke Lynes (Rochester Hills, MI) scoring what seemed like an inevitable goal at 19:38. Just 25 seconds into the third period Lynes was charging the STU net again, but this time he was called for goaltender interference. After UNB killed off the penalty, coach MacDougall made some adjustments to his lines to change things up, including moving Tremblay to a new line with Lachlan MacIntosh (Perth Andover, NB) and Ryan Seymour (Fredericton, NB). It was an interesting combination, and paid off at 8:33 when Tremblay scored backhanded. The prettiest goal of the game came at 14:57 when Harty, who passed up a good scoring chance earlier in the period when he passed off the puck to Tremblay, this time was in the middle of some tic-tac-toe passing with Seymour that found Tremblay all alone at the open side of the net. Not only was it a hat-trick goal, but the third game point tied Tremblay with Rob Hennigar for UNB's career record, at 177 points. Interestingly, Tremblay's rookie year he played on Hennigar's line and helped him set the record that he has now tied, and will surely pass. Less than a minute later UNB's Bailey got into a heated neutral ice skirmish with STU's Judson that drew a crowd of V-Reds players. Bailey was called for four minutes for head butting in the fracas, and STU would essentially finish the game on the power play. Well their power play was about as effective as UNB's, and worse, Lavigne was forced to make two big saves on penalty killing Culligan. Travis Fullerton earned his second shutout of the season in the 4-0 win, and he wasn't near as busy in nets as Lavigne as the V-Reds outshot the Tommies 40-14 in the game. Despite the loss, STU head coach Mike Eagles felt that his team was improving and at least laying the foundation to win hockey games, whereas he didn't feel they competed hard enough in the first seven games of the season. While not making excuses, he offered that "I've never had so many man-games lost as we have had this term" due to all the player injuries and suspensions. As for UNB, while Gardiner MacDougall wasn't happy with the V-Reds' power play (now goalless in three straight games), he was pleased for Hunter Tremblay's big night, as he said his passion for the game and caring for his teammates is unmatched in the locker room. Coming into this game, Hunter Tremblay was 3 points behind Rob Hennigar on the all-time UNB Regular Season scoring list. With the three goals he scored in UNB's 4-0 victory this afternoon, the two share first place for the time being. Luke Lynes scored the other UNB goal, while Travis Fullerton was there when called upon, earning his second shut-out of the season. Final shots favoured UNB 39-12. This one probably won't be remembered as the team's best effort of the year. At times in the first two periods, UNB didn't seem to be in synch, and early in the second period Coach MacDougall even called a time-out to settle the team down. Jeff Lee left the game early with some type of injury. Let's hope it's nothing serious. The win puts a bit of distance between UNB and UPEI. The V-Reds have 20 points, while the surprising Panthers aren't far behind at 17. Tomorrow at 2pm STU (1-7-2) comes into the AUC looking to avenge the 7-1 loss they suffered back on October 16th. STU has lost 23 games in a row to the V-Reds (9-2-0); and will be looking to stop that streak and start one of their own. STU comes into this game on a six game losing streak, and is sitting last in the AUS. STU are led in scoring by Alex Labonte and Yuri Cheremetiev with 9 and 8 points respectively. UNB now holds a one point lead over UPEI who won 6-3 over UdeM tonight. The V-Reds will be looking to increase that lead to 3 points and to continue their momentum towards Nationals. The V-Reds are led in scoring by Hunter Tremblay and Chris Culligan with 17 points each. The Tremblay watch will continue as he sits only three points back of Rob Hennigar for the all time regular points (177) record. To look at their compared stats you can click here. Tomorrow's game will be available on CHSR radio, and followed on UNBHockey on Twitter. A balanced attack helped the V-Reds to a 3-1 win at the Aitken Centre against the visiting Aigles Bleus de UdeM. Luke Lynes opened the scoring, and Lachlan MacIntosh scored the winner. Rookie Nick MacNeil added a late goal for the V-Reds. Chris Culligan and Hunter Tremblay were both held off the scoresheet. Derek Yeomans had a good game in goal stopping 22 of 23 shots fired at the UNB. Final shots were 38-23. The win leaves UNB in first place in the AUS with 18 points, 3 points up on UPEI, and 5 points ahead of STFX who managed to beat SMU by a 5-4 score. Former V-Reds goalie Mike Ouzas has been loaned to the Houston Aeros of the AHL. Ouzas had been playing for the Las Vegas Wranglers of the ECHL. Bruce Hallihan has a nice piece in today's Daily Gleaner on one of the unsung heroes of the Varsity Reds, Josh Hepditch. Hepditch might always be remembered best for changing the momentum in the gold medal game against Moncton a few years back with a calculated launch into the UdeM bench. Remember, there's just a couple of days left to vote for your All-Decade team for the 1960's. Vote often! Finally, we were sad to learn of the passing of former UNB Red Devils captain, Dr. Arnold McAllister. The funeral service will take place Saturday. The Daily Gleaner provides more information. Week 5 results of the AUS Pool are up. There's no change in the leaders but there's lots competitors positioned to make a run for the top. Jack Gillis continues to dominate the standings with 115 points, but 12 others have hit the century mark for points already. This week's top performer was blackmarketmob who put up an impressive 28 pts, enough to make the jump from #11 to #4. The complete list can be found by clicking the link on the sidebar. If you think there's a mistake in any of the totals, send us an email and we'll look into it for you. With five weeks complete in the AUS, the CIS has released the fifth Top 10 Rankings of the year. The top three teams remain the same, but UNB lost some first place votes with their 3-1 loss to SMU on the weekend. SMU and UPEI remain in sixth and eighth respectively. Here's how the rankings look in the fourth media poll. Other teams receiving votes: Lakehead (14), Acadia (4), StFX (3), Carleton (3), Ottawa (2), Wilfrid Laurier (2), Waterloo (1). The full top ten story can be found here. HALIFAX - The Saint Mary's Huskies took advantage of their special teams, and a little luck, to defeat the visiting UNB Varsity Reds 3-1 Saturday night at the Halifax Forum. The loss halts UNB's win streak at eight games, and more importantly for SMU, allows the Huskies to sweep their weekend games after losing twice last weekend, including a 5-2 loss to the V-Reds. Like the game the night before against StFX, UNB came out with a physcal intensity to start the match. However early on V-Red Matt Fillier (Durham, NS) was assessed a double-minor for roughing in a skirmish in the Huskies corner with Michael Stickland (Red Deer, AB), who received a single minor. While killing the penalty, UNB defenceman Josh Hepditch (Fredericton, NB) was called for slashing while trying to stop a rushing Andrew Hotham (Barrie ON), and the Huskies had a two-man power play for 56 seconds and they took advantage when Chris MacKinnon (Richmond Hill, ON) scored from the circle at 4:44. Less than two minutes later MacKinnon took a slashing penalty, but UNB didn't score on the power play. Fillier took his second penalty of the period at 9:14, when he got called for boarding for a heavy hit on Ryan Gottschalk (Markham, ON). Less than a minute after a good penalty kill, the V-Reds had some bad luck. UNB goaltender Travis Fullerton (Riverview, NB) went behind the net to play the puck on a dump-in, but the puck caromed out of the corner right to the front of the net, and Brad Smith (Summerside, PE) had an empty net for an easy tap-in goal at 12:01. It was the first goal of the season for Smith, and his first since he scored the overtime winner for the Huskies at the 2010 University Cup back in March. Two minutes later UNB rookie Nick MacNeil (Creignish, NS), shorthanded, forced Huskies goalie Neil Conway (Painesville, OH) to make perhaps the save of the period. The V-Reds finally scored late in the period, at 19:13, when Lachlan MacIntosh entered the Huskies zone on the left side while his two linemates went to the net. MacIntosh continued on behind the net and out the right side and almost to the top of the right circle before letting loose a quick wrister that beat Conway. There was no scoring in the second period, but the UNB bench was not happy when defenceman Ben Wright (Foremost, AB) was assessed a checking from behind minor (and automatic 10-minute misconduct) by referee Mark Hulshoff at 8:43 on a pretty innocuous looking shove well away from the boards. As a result Wright couldn't return to the ice until the third period. UNB did have a power play four minutes later and generated a number of shots, but couldn't put the puck past Conway. UNB took yet another penalty late in the period that carried over to the third period. Once UNB got through the penalty kill to start the third period, they got back to work trying to score on Conway. However Jordan Clendenning (Fredericton, NB) was called for cross-checking for 4:08, and defenceman Bretton Stamler (Edmonton, AB) was assessed a hooking call while on the penalty kill, and the Huskies had another five-on-three, this time for 1:02. UNB killed off the penalty successfully, and eventually had their own power play at 13:39 when Kyle Wharton (Stittsville, ON) was called for tripping. However, just over a minute in the power play Jonathan Harty (Oromocto, NB) was called for tripping and the man advantage disappeared. With just over three minutes to go in the game, Conway stopped a Chris Culligan (Howie Center, NS) shot, and Josh Hepditch jumped on the rebound and forced Conway to make a huge save. Worse news for UNB was that the referee decreed after the save that V-Reds had too many men on the ice while making the line change on the play, and they would be shorthanded yet again. After killing off the penalty, UNB pulled Fullerton with about 40 seconds to go, but they lost control of the puck in the neutral zone and Shawn O'Donnell (Halifax, NS) flipped the puck into the empty net at 19:43. The 3-1 victory was the first for the reigning CIS Champion Huskies over the V-Reds since March 18, 2009, when SMU won the deciding game of the best-of-three AUS championship series. Interestingly in that year UNB went on to win the University Cup as the wildcard entry in Thunder Bay. Shots in Friday's game were 25-21 in favour of SMU, but the shot counters appeared stingy in light of the offensive bent of the game. SMU was 1-for-10 on the power play while UNB was unsuccessful on their five power play opportunities. Next weekend UNB is home to the UdeM Aigles Bleus on Friday night, and then cross-campus rival St. Thomas in a rare Sunday afternoon game. Saint Mary's is at home to Acadia on Wednesday, are at StFX on Friday, and back home Saturday when they host Dalhousie. An early 5-on-3 power play goal was the difference in very close game that saw the SMU Huskies get past the Varsity Reds by a 3-1 score. It was a one goal game until the last few seconds when SMU scored an empty-netter. Lachlan MacIntosh scored the lone UNB goal. Travis Fullerton took the loss in net. Penalties will be the game story for this one, and UNB's power play unit couldn't capitalize on its chances. The loss leaves UNB with an 8-2 record and still in first place in the AUS. ANTIGONISH - The University of New Brunswick men's hockey team made it two wins in six days against their playoff nemesis StFX, with a decisive 6-1 win on the road Friday night in Antigonish. Led by Chris Culligan (Howie Center, NS) with two goals and two assists, linemate Hunter Tremblay (Timmins, ON) with a goal and two assists, and defenceman Ben Wright (Foremost, AB) with three assists, the Varsity Reds had the edge in the physical play, dominated the puck battles and outshot the X-Men 35-23 (although the game clock had the shot tally at 46-29) before 1300 fans at the Keating Millenium Centre Arena. Like Saturday night in Fredericton, this game was intense from the opening faceoff, and both teams made sure they finished all of their checks and took every opportunity to take the body. After trading early penalties it was UNB opening the scoring when Wright let loose a quick wrist shot just inside the blue line through the crowd in front of the net, and Lachlan MacIntosh (Perth Andover, NB) deflected it past X-Men goaltender Bryan Gillis (Lantz, NS) at 11:08. The Varsity Reds extended their lead at 13:00, shorthanded, when Tremblay and Culligan were two-on-one in the X zone. After Gillis initially stopped Tremblay, the puck eventually came back to Culligan who beat Gillis on the other side of the net with his backhand. Late in the period StFX captain Chris Hulit (Sault Ste Marie, ON) was called for cross-checking and Culligan was all alone at the side of the net to bang in the rebound from a heavy Wright point shot for the power play goal at 18:43. There was no scoring in the second period, and one reason was the scintillating save Travis Fullerton made just over eight minutes in on Hulit and Bryce Swan (Alder Point, NS) on a two-on-one rush. Once again StFX took a penalty late in the period, this time Matthew Bragg (Newmans Cove, NF) with an elbow to Dion Campbell (Melville, SK)'s head. As a result UNB reaped their reward early in the the third period on the power play, as Jonathan Harty (Oromocto, NB) almost skated in too far for the back door play pass from Tremblay, but recovered in time to recover the puck and put it in the far side of the net at the 33 second mark. Less than three minutes later UNB made it 5-0 when Bretton Stamler (Edmonton, AB) headmanned the puck to Tremblay in the neutral zone who then accelerated, split the X-Men defence, went in alone on Gillis and beat him glove side with a quick wrist shot. StFX finally spoiled Fullerton's shutout bid at 15:39, when Swan scored backhanded on the power play. UNB got that goal back at 17:42, also on the power play, when Jordan Clendenning (Fredericton, NB) was unmolested in the slot to make it a 6-1 final for UNB. Immediately after the game UNB head coach Gardiner MacDougall was pretty satisfied with the play of his team. "We had a good complete team effort tonight. All four lines, all six defencemen and goaltender Fullerton played well. We needed a strong penalty kill tonight and got it. The team had a lot of energy and there was some great hits." UNB was 3-for-7 on the power play while StFX was 1-for-6 with the man advantage. The three game stars were: 1. Chris Culligan 2. Hunter Tremblay 3. Bryan Gillis. Culligan had a combined five goals in two games against StFX. Saturday night UNB will be in Halifax to play the CIS champion Saint Mary's Huskies. A quick three-goal outburst in the first period powered the visiting Varsity Reds to a 6-1 victory at Antigonish against the STFX X-Men. Scoring for UNB were Lachlan MacIntosh, Chris Culligan with two (including one short handed), Jonathan Harty, Hunter Tremblay, and Jordan Clendenning. Shots favored the good guys by a 46-29 margin. Travis Fullerton continued his exceptional play this season by stopping 28 of 29 shots fired against him. The UNB win combined with a UPEI overtime loss vs SMU further separates the V-Reds from the pack in the AUS standings. UNB now has 16 points, while second place UPEI sits five points back with 11 points. Here's the game story courtesy of The Daily Gleaner. The CIS #3 V-Reds travel to Antigonish tonight to do battle with the X-Men at 7pm at the Keating Millenium Centre. The one previous contest between these two teams this regular season saw the V-Reds skate to a convincing 6-2 victory here last weekend. The V-Reds are on a 1-4-0 in their last five games against the X-Men, and will not take them lightly on thier own home ice. The V-Reds are led offensively by Hunter Tremblay and Chris Culligan with 14 and 13 points respectively. The X-Men are in a freefall. They recently dropped out of the CIS top ten rankings and have lost thier last four games and will be looking to turn things around against the AUS leading V-Reds. The X-Men are led offensively by Chris Hulit and Jason Bast with 13 and 9 points respectively. The game is availabe as a webcast from the SSN website, can be heard on CHSR, and can be followed on UNBHockey on Twitter. There's still lots of movement in the AUS pool, and at the end of Week 4 Jack Gillis holds the lead with a total of 88 points. You will notice that UNB and SMU players are all missing the totals from last Friday's UNB vs. SMU game. Because we use the official AUS website as our scoring authority, and because the official stats don't yet include the totals from that game, we haven't added them. This will be resolved in future weeks when the AUS corrects the stats. But for those of you who can't wait, you can visit the CIS website to find the total points for your players. This week's top performer was Section 10 with a massive 26 point outburst. Was it skill, or fluke? Time will tell. We've just passed the quarter-mark of the AUS regular season so there's still lots of hockey left. Look at some of the big jumps folks like Section 10 and Hardy Fan have made in just one week! As always, if you see any errors, send us an e-mail and we look into it for you. With four weeks complete in the AUS, the CIS has released the fourth Top 10 Rankings of the year. The top three teams remain the same, but the Redmen and the V-Reds each have seven votes for first, while The Golden Bears only got four. Saint Mary's remains in the top ten, dropping to sixth, while StFX has dropped to 11th, and UPEI surging up to eighth. Other teams receiving votes: StFX (34), Concordia (23), Guelph (5), Acadia (4), UQTR (2), Lakehead (1). Chris Culligan's big weekend scoring a hat trick vs STFX and adding two assists vs SMU was more than enough to give him the nod for this week's UNB/Valley Graphics Male Athlete of the Week award. By our count, the second-year centre from Howie Centre, NS now has 13 pts in 7 games and is starting to heat up. FREDERICTON The most anticipated game of the season was worth waiting for, as the UNB Varsity Reds men's hockey team defeated the StFX X-Men 6-2 in a game that all had the intensity of a playoff match, and perhaps more. Led by a natural hat trick from Chris Culligan, and encouraged on by 2813 fans at the Aitken University Centre, the V-Reds overcame an early deficit to take the first step in redemption for last season's playoff elimination by the X-Men. StFX of course was the only team to defeat UNB last season, halting the V-Reds winning streak at 26 games. A few weeks later they then went on to upset UNB in the second round of the AUS playoffs, in three straight 3-2 victories. The X-Men started this season with four wins, which only heightened the anticipation for their first visit to Fredericton. That anticipation probably turned to worry soon after the drop of the puck, as the X-Men took it to UNB early on, helped by the fact that Hunter Tremblay (Timmins, ON) was called for elbowing just 23 seconds into the game. The X-Men were first on the scoreboard, at 4:01, when Matthew Bragg (Newmans Cove, NL) scored off a rebound on the rush as he beat Travis Fullerton (Riverview, NB). X was outshooting UNB 7-4 at that time. The momentum didn't shift the V-Reds' way until they started killing off a slashing penalty to Spencer Corcoran (Summerside, PEI) at 10:37, after Corcorcan responded to being checked into the X-Men bench. Less than a minute later UNB captain Kyle Bailey (Ponoka, AB) and rookie Nick MacNeil (Creignish, NS) roared up ice on a shorthanded two-on-one rush. In the X zone the desperate X-Man defender slid full body across the ice to take Bailey down, but not before he got the puck across to MacNeil who tipped the puck past Joey Perricone (San Juan Capistrano, CA) to tie the game and bring the relieved fans to their feet. UNB still had to kill off the penalty, and almost got another shorthanded goal just before the penalty expired, when Perricone made a right pad save on Tremblay off a breakaway. Seconds later Chris Culligan (Howie Center, NS) and defenceman Bretton Stamler (Edmonton, AB) collaborated on a goal to put UNB in the lead, with the puck apparently going off the goalie's stick or skate just before it got to Stamler at the open side of the net. The physical intensity escalated at the game played on, and at the end of the period there was all sorts of chirping and a bit of a scrum as the teams left their benches, highlighted by X's Bryce Swan (Alder Point, NS) coming back across the ice to "chat" with some of the UNB players heading off. Referee Thayer Doyle then assessed StFX a bench minor for leaving the bench early. Shots in the first period were 14-13 in favour of UNB. So the second period started with a fresh sheet of ice and UNB on the power play. It only took the V-Reds 34 seconds to take advantage of the opportunity of the man advantage, when defenceman Ben Wright (Foremost, AB) hammered a point shot off the rear boards so that it would rebound into the dog pile in front of the StFX net, and Culligan got a couple of whacks at the puck before getting it past Perricone. For X-Men coach Brad Peddle, this was the turning point in the game, as it put UNB up 3-1 "and we found it tough to respond after that goal. We had to start taking risks, and got burned." It was 13:01 when Culligan completed his natural hat trick, as he tipped in Jonathan Harty (Oromocto, NB)'s point shot. Soon after UNB was on the power play, and Bailey in front of the X-Men net sustained a tremendous battering from behind by defenceman Nick Pageau (Stoney Creek, ON) before Pageau was finally called for roughing. Although the V-Reds didn't score on their 38 second five-on-three advantage, it was Bailey who turned on a loose puck in front of the net for the power play goal at 15:27. Just over a minute later, and after the whistle and blown play dead, UNB's Josh Hepditch (Fredericton, NB) was knocked down at centre ice by Derek Claffey (Red Deer, AB) and that precipitated another scrum. X's Stephen Simms (Reidville, NF) and UNB's Harty got roughing minors, and both Claffey and Harty were given addition 10-minute misconducts. Since it was Harty's second misconduct of the game, he was automatically given a game misconduct. The V-Reds had already lost defenceman Luke Gallant (Bedford, NS) on his first shift of the game when he went down blocking a shot, so UNB would finish the remainder of the game with four d-men. While there were no more penalties called in the period, both teams came close as the tension built. UNB outshot X 15-6 in the middle period. During the intermission both coaches must have told their respective teams to dial back the animosity, as play that looked to be getting out of hand was certainly calmer in the third period. UNB dominated the start of the period, and StFX never got out of their zone before Luke Lynes (Rochester Hills, MI) on the cycle snapped in a rebound at 2:20 to make it 6-1 for the home team. StFX had two power play opportunities midway through the period, but didn't score again until their man advantage for the final two minutes of the game, when rookie Scott Brannon (Stellarton, NS) scored at 18:49. Despite their power plays, StFX was still outshot by UNB 15-11 in the period, and 44-30 in the game. For captain Kyle Bailey, "while we didn't get off to out expected start," he thought UNB's work ethic came through, and the turning point was MacNeil's shorthanded goal. Bailey stated that he loves these emotional games against tough opponents, and wished "every weekend could be like this". Well he's going to get his wish, as Friday UNB will be in Antigonish to play StFX again, and then Saturday night they will be in Halifax to renew acquaintances with Saint Mary's. Game Notes: UNB was 2-for-4 on the power play while StFX was 1-for-7 with the man advantage. The three stars of the game were: 1. Chris Culligan 2. Kyle Bailey 3. Ben Wright. Bailey led all centres going 15-5 on the face-off dot while X's Phil Mangan was next best at 12-6. While UNB defenceman Ben Wright returned to the lineup, fellow d-man Ben Shutron (Orleans, ON) is still out long-term, along with forwards Daine Todd (Stettler, AB) and Taylor Procyshen (Emerald Park, SK). Dion Campbell (Melville, SK), off to a terrific start this season, missed both weekend games with an illness, and will see a doctor Monday. StFX centre Brett Robertson has not played this season, and is not expected back with a long term injury. The Varsity Reds sported a new patch on the right sleeve of their jerseys this weekend - it says simply "Ted" in honour of the late Ted Bedard, a WWII veteran, star player for UNB from 1946-51, and longtime active supporter of the hockey program who recently passed away. Saturday's 6-2 win is UNB's seventh in a row, and keeps them in first place in the standings, four points ahead of UPEI. The Varsity Reds cruised to their seventh straight win with a 6-2 pounding of the STFX X-Men at the Aitken Centre on Saturday night. Led by a 3 goal performance from sophomore Chris Culligan, the Varsity Reds offence was too much for STFX goalie Joseph Perricone on this night. Luke Lynes and Nick MacNeil helped out with a goal each while Kyle Bailey rounded out the UNB goal scoring. Honourable mention has to go to Ben Wright who has been very good so far in his first two games of the season. Travis Fullerton made 27 saves for the win. The win moves UNB 4 points up on the surprising UPEI Panthers, who were winners over SMU this evening. UNB sits on top of the AUS with 14 points. V-Reds look for some REDemption tonight! The CIS #3 ranked V-Reds host the CIS #6 ranked X-Men at 7pm tonight at the AUC. Tonight's game will hold a lot of significance for the players, coaches, and fans. This is the first meeting between these two teams since the X-Men came into the AUC on Feb. 12th last year and gave UNB their first regular season loss (4-3), after 26 straight wins, ending UNBs quest to have an undefeated season. A few weeks later, they ended UNB's bid to return to the Nationals and defend their title with a stunning three straight game upset, including a 3-2 victory over the V-Reds that all the fans will remember which saw the V-Reds out shoot the X-Men 31-6. The X-Men are coming off of a 7-3 loss last night at the hands of the UPEI Panthers, and are currently on a three game losing streak that they will be looking to turn around. The X-Men are led in points by Chris Hulit and Bryce Swan with 13 and 8 points respectively. The V-Reds, on a current six game winning streak, are sitting atop the AUS conference and will look to extend their three point lead over the X-Men tonight. The top line of Hunter Tremblay, Chris Culligan, and Jordan Clendenning have been looking like a well oiled machine of late, combining for 29 points thus far this season, and will look to continue their dominance of opposing lines. The game is available as a webcast from the SSN website, and can be followed on UNBHockey on Twitter. Unlike their exhibition game back on September 25, which was an embarrassing 10-3 loss for Saint Mary's, Friday night's hockey game between the Huskies and the V-Reds was a close physical affair for two periods, before UNB pulled away in the third period for the 5-2 win. The V-Reds were led by player of the game Hunter Tremblay with a goal and an assist, while linemates Jordan Clendenning and Chris Culligan each had two assists. It was a humid night at the AUC, and the glass had to be cleaned with squeegees multiple times before the ceremonial faceoff by the Lieutenant-Governor, the Honourable Graydon Nicholas, along with Commonwealth Games bronze medalist wrestlers Eric Feunekes (4th year UNB Engineering student) and Promise Mwenga (UNB BBA grad). It was a chippy game to start, and just five seconds into UNB's third power play Kyle Bailey (Ponoka, AB) won the faceoff and Hunter Tremblay (Timmins, ON) got the puck back to Jonathan Harty (Oromocto, NB) on the point, who ripped the shot past SMU goalie Neil Conway (Painesville, OH) at 11:29. SMU responded at 16:37, shorthanded, when Harty was caught flatfooted on the point and the Huskies went on a 3-on-2 the other way with Huskies defenceman Kyle Wharton (Stittsville, ON) on the rush snapping the puck over Travis Fullerton (Riverview, NB)'s left shoulder, and just under the crossbar. Shots favoured UNB 13-5 in the first period. UNB extended their lead to two goals at 3:18 of the second period, when defenceman Ben Wright (Foremost, AB), playing his first conference game for UNB after coming back from a knee injury, jumped into the play and took a nice cross ice feed from Chris Culligan (Howie Center, NS) right on the doorstep for the easy tap in. However, UNB's Matt Fillier (Durham, NS) got called for high sticking seconds later and SMU's power play went to work. Defenceman Andrew Hotham (Barrie, ON) pinched into the circle and one-timed a nice feed from the cycling Cam Fergus (Brantford, ON) to score at 4:20 to tie the game up again. It is the first power play goal UNB has given up in three games. UNB got their lead back at 12:29, on the power play, when Luke Gallant (Bedford, NS) blasted a high point shot that initially Tremblay looked to have tipped past Conway. UNB took a penalty short after, and had mostly killed it off when under pressure from Tremblay the SMU goalie tripped behind the net while trying to play the puck and Tremblay was called for interference to a chorus of boos from the UNB fans. This gave a brief 5-on-3 power play to the Huskies, but UNB survived that and the Tremblay penalty in a key penalty kill. Shots were 13-6 for SMU in second period. Seconds into the third period Tremblay was stoned by Conway close in, after a crisp pass by Jordan Clendenning (Fredericton, NB). The two connected successfully five minutes later, when Tremblay cruised into the slot and took another nice pass from Clendenning to make it 4-2. The game was delayed for several minutes after the goal, as over-exhuberant fans shook the glass behind the Saint Mary's bench, causing one panel to shatter, necessitating a hasty clean-up. Tthe prettiest goal of the night came at 15:30 when Lachlan MacIntosh (Perth Andover, NB) and Nick Layton (Salisbury, NB) had a two-on-rush and MacIntosh deked out Conway to finally score his first goal of the season. UNB head coach Gardiner MacDougall liked how his team responded after the second period. ?The leaders in the room had to exhibit a better effort in the third period, and they did from the opening shift. We needed to simplify our game against a tough opponent, and we accomplished that.? While UNB got Ben Wright back for the game they were missing Dion Campbell (Melville, SK) who was sick. Defenceman Spencer Corcoran (Summerside, PEI) moved up to play wing on UNB's fourth line to make a spot for Wright, and Lachlan MacIntosh took Campbell's spot with Jeff Lee (Calgary, AB). UNB's second line saw Kyle Bailey centring Nick MacNeil (Creignish, NS) and Nick Layton to complete the line juggling. The three stars of the game were 1. Hunter Tremblay 2. Jordan Clendenning 3. Bretton Stamler. Attendence was 2238. UNB was 2-for-8 on the power play while SMU was 1-for-5 with the man advantage, plus the shorthanded goal. Travis Fullerton made 23 saves in the game for the win, with 12 in the second period. Neil Conway faced 31 shots from UNB in the loss. Over 2200 fans were treated to a pretty good game of hockey this Friday night when the reigning National Champion SMU Huskies visited the UNB Varsity Reds at the Aitken Centre. Lead by goals from Hunter Tremblay, Jonathan Harty, and Lachlan MacIntosh, the V-Reds skated to a 5-2 victory. Travis Fullerton was great when called upon, stopping 21 of 23 shots for the win. Jordan Clendenning had a strong game with a pair of assists. He and Huskies forward Mike Danton seemed to develop a bit of a mini-rivalry during the pre-game skate that carried over to the game. The evening also featured the return of defenceman Ben Wright to the UNB lineup. Dion Campbell was out sick, so Spencer Corcoran actually played some shifts as a forward, throwing his weight around. The UNB victory, combined with STFX's 7-3 loss to UPEI leaves the V-Reds 3 pts up on STFX for first place in the AUS. The X-Men visit UNB tomorrow night at 7 PM. Tonight, the CIS #3 ranked V-Reds take on the CIS #4 ranked Huskies for the first time this regular season. Although some may look back at the 10-3 thrashing that the V-Reds gave the Huskies back in the preseason, the Huskies have quietly been building their momentum, going 3-1-0 in their first four games, and only allowing 8 goals in that span behind the goaltending of Neil Conway. The Huskies can boast the best power play in the AUS thus far this season (.250), best goals per game (5.00), along with the best save percentage (.932). The Huskies are led in points by Andrew Hotham and Cam Fergus with eight and seven points respectively. The V-Reds, currently on a five game winning streak, look to continue their winning ways and to continue building momentum towards Nationals in March. The V-Reds lead the AUS in goals allowed per game (1.50), penalty-killing (.935), and goals scored (27). The V-Reds are led in points by linemates Hunter Tremblay and Chris Culligan with 11 and 9 points respectively. The game is available on webcast from the SSN website, and can be followed on UNBHockey on Twitter. UNB hockey fans, starting now you get to help pick the UNB hockey All-Star Team of the Decade for the 1960's. This is the first of six different eras we will be honouring over the next two years in conjunction with UNB's hosting of the Cavendish University Cup. You get to vote for six players from 24 names nominated by the Legacy committee. After the first round of voting, we will reduce the nominees to the top twelve vote getters, and voting will start again until we are down to the final six players. Everyone is entitled to vote up to three times each week, and will be completed on November 28. Each time you vote you pick three forwards, two defencemen and one goalie from 24 UNB players who starred in the 1960's. You simply have to provide an e-mail address as your login to join the voting, and create your own password. You don't even have to vote for the same six players each time you vote. So vote early and vote often by clicking here! Edit: More on the voting courtesy of Friday's edition of The Daily Gleaner. Week 3 of the AUS pool is in the books. Jack Gillis takes the lead at the top of the standings with an impressive 71 pts powered by the likes of Cory Vitarelli and Andrew Hotham. Last year's powerhouses "Barney" and "Fan of the Vreds" are middle of the pack and poised to make a move. There's just a bad weekend separating first from last place though, and lots of hockey left early in this season. Here's how the standings look. We'll get the pool page updated asap. As always, check your totals. If you feel we made a mistake, we probably have, so kindly let us know by sending us an email. In Thursday's edition of The Daily Gleaner, Bruce Hallihan gets a few words with captain Kyle Bailey about the upcoming weekend and even a few thoughts on last season's disappointing playoff performance. As AUS regular season weekends go, this is about as good as you could expect on home ice - the reigning national champions, and the team that ended your season are both visiting in back-to-back nights, so make sure you get your tickets and come out to the games. It just so happens both teams are immediately behind UNB in the standings in what's shaping up to be a typical tight race in the AUS. With three weeks complete in the AUS, the CIS has released the third Top 10 Rankings of the year. The top three teams remain the same, each receiving 6 first place votes. This is not likely to change as long as they all keep up their winning ways. The three AUS teams in the top ten will do battle this weekend as the V-Reds host SMU Friday night and StFX on Saturday night at the AUC. Here's how the rankings look in the third media poll. Other teams receiving votes: UQTR (13), Wilfrid Laurier (11), Concordia (7). Lakehead (5), Acadia (4). Third year defenceman Bretton Stamler has been named the UNB/Valley Graphics Male Athlete of the Week following his solid performance this past weekend. In addition to being a workhorse defensively, he chipped in with a shorthanded goal and an assist. Well done, Bretton. Also, Bill Hunt interviews Hunter Tremblay in today's edition of The Daily Gleaner. Among things discussed are Tremblay's decision to come to UNB, and his pursuit of the scoring records. The first meeting of the season between the men's hockey teams of provincial rivals University of New Brunswick and Université de Moncton saw the Varsity Reds blank les Aigles Bleus 4-0. UNB goaltender Travis Fullerton got the shutout at the J. Louis Levesque Arena in Moncton while Bretton Stamler, Hunter Tremblay and Chris Culligan each had a goal and an assist for the V-Reds. A fairly even game to start, UNB pulled away as the game progressed, outshooting UdeM 44-22 by the time it was all over for their fifth win in a row. The game had a physical edge from the first drop of the puck as the rivals renewed acquaintances. At 9:09 UNB opened the scoring with Hunter Tremblay in the penalty box for tripping.Chris Culligan (Howie Center, NS) scooped up a loose puck and streaked to the other end of the ice, attempting to score backhanded on Pierre-Alexandre Marion (Gatineau, QC). The Moncton goalie made two initial saves, but he wasn't able to get across the crease before defenceman Bretton Stamler (Edmonton, AB) popped the rebound into the open side of the net for his first goal of the season. There was no other scoring in the period, but they came close, when Nick Layton (Salisbury, NB) rang the puck of the iron for the second night in a row. Shots in the first period favoured UNB 11-9.
frustrate les Aigles Bleus with an efficient penalty kill, but just as the PK was ending defenceman Jonathan Harty (Oromocto, NB) went end-to-end and forced Marion to make a tough save in close. Later in the period, at 18:30, Charles Bergeron (St-Joseph-de-Coleraine, QC) appeared to forget that there were two referees working the game, as he spun Fullerton around behind the play and was tagged for goaltender interference. On the subsequent power play Gallant's point shot was blocked by a sprawling Moncton defender but Hunter Tremblay (Timmins, ON) snapped the rebound through a crowd, and Marion, to make it 2-0 at 19:29. UNB outshot UdeM 16-9 in the middle period. UNB kept the pressure on in the third period, but didn't score again until 14:12, when Culligan again rushed the length of the ice, this time going backhand to forehand as he deked out Marion for the goal. The prettiest goal of the game came less than two minutes later when Nick MacNeil (Creignish, NS) and UNB captain Kyle Bailey (Ponoka, AB) had a two-on-one rush, and Bailey's off balance shot found the top right corner of the net. The game finished with both teams shorthanded, and a bit of pushing, shoving and chirping after the final whistle. The V-Reds outshot Moncton 17-4 in their dominant final period and 44-22 in the game. UNB was 1-for-7 on the power play while UdeM went 0-for-6 with the man advantage. It is the third game in a row that UNB has not given up a power play goal, and the second game in a row they scored a shorthanded goal. Aigles Bleus head coach Serge Bourgeois watched the game from the pressbox, serving out his one-game suspension as a result of the fracas at the conclusion of the UdeM-STU game on Wednesday. With the win, UNB is now 5-1 and in sole possession of first place in the AUS standings. StFX, who lost 4-3 in an overtime shootout to Dal Saturday night, are now one point back in second place. Travis Fullerton's first shutout of the season helped UNB to a 4-0 road victory against UdeM. Bretton Stamler opened the scoring halfway through the first period with a shorthanded goal that was largely the result of the great effort by Chris Culligan. Also scoring for the V-Reds were Hunter Tremblay, Chris Culligan, and Kyle Bailey. Rookie Nick MacNeil pitched in with two assists. Final shots favoured UNB by a 44-22 margin. The win, combined with a STFX loss in overtime to the Dalhousie Tigers, leaves UNB in sole possession of first place in the AUS standings with 10 pts. UNB will turn their attention to the two big games against SMU and STFX at the Aitken Centre next weekend in what's sure to be a playoff like atmosphere. The University of New Brunswick Varsity Reds ensured that there would not be a repeat of their season opening loss to the UPEI Panthers men's hockey team, as they controlled the game from start to finish in the 4-1 win, outshooting the visitors 41-19 in the game. The V-Reds offense was led by the first line, with Hunter Tremblay (Timmins, ON) scoring a goal plus assisting on the goals from linemates Jordan Clendenning (Fredericton, NB) and Chris Culligan (Howie Center, NS) in front of 2303 fans. With their fourth win in a row, UNB moves into a first place tie with StFX in the AUS standings. There was a good pace to the game from the opening faceoff at the Aitken University Centre in Fredericton. The V-Reds speed drew the Panthers into penalties fairly early in the game, and on the second UNB power play Hunter Tremblay was deep in the UPEI zone with two open teammates to pass to. He elected to go through the slot to Clendenning who one-timed the puck past Mark Guggenberger (Richfield, MN) at 12:18. A minute later Dion Campbell (Melville, SK) was held up in front of the Panthers bench on a line change, and UNB was called for too many men on the ice. However on the penalty it was the V-Reds getting the best scoring chance, when Guggenberger was forced to make a big save with his right pads on Culligan. Late in the period UNB goaltender Derek Yeomans (St. Albert, AB) was tested, when he was forced to make a save off the streaking Jordan Knox (Skinner's Pond, PE) on a breakaway. The shots in the first period were 13-5 for UNB, and indicative of the territorial play. The Panthers had a power play early in the second period, but it was UNB getting the two-on-one the other way. Tremblay snapped a pass cross-ice to Culligan who tipped the puck past Guggenberger who did the splits in trying to make the save2:41. UNB kept up the pressure and scored again at 7:46 when Jeff Lee worked the puck down low on the cycle, then bulldozed his way from behind the net on a wraparound attempt, and Luke Lynes (Rochester Hills, MI) knocked in the rebound for his first goal of the season. Although UNB was dictating most of the play, UPEI did get their opportunities. After Yeomans made a big save on Mike MacIsaac (O'Leary, PE) the Panthers kept up the pressure on the cycle until Matt Carter (Mississauga, ON) finally solved the UNB netminder at 14:36. A few minutes later UNB was on the power play, and their best scoring chance was when Nick Layton (Salisbury, NB) rang his shot off the crossbar after a sequence of crisp passing. At the end of the period one of the Panthers put the puck into the UNB net after the whistle had gone, which drew a crowd including V-Reds captain Kyle Bailey (Ponoka, AB). When the scrum was over both Bailey and UPEI's Cory Vitarelli (Peterborough, ON) were given roughing penalties to commence at the start of the third period. Shots in the second period favoured UNB 13-7. The third period was much like the second, with UNB dominating the play. Nick MacNeil (Creignish, NS) hit the left post with a loud clang just over two minutes in, and that was the V-Reds' best scoring chance until five minutes later, when Tremblay was alone at the edge of the crease to tip in a pass from Clendenning at 7:16. That was the end of the scoring in the game, which saw UNB outshoot UPEI 15-7 in the final period and 41-19 on the night. The V-Reds were 1-for-5 on the power play while the Panthers went 0-for-5. After the game UNB head coach Gardiner MacDougall noted that the biggest difference when comparing the win over UPEI with the loss on opening night in Charlottetown was hard work. ?Our whole game revolves around work ethic and having all four lines going. Tonight we got contributions from everyone, and our penalty kill was good, plus got a shortie. MacDougall singled out the energy line for their work, and in particular Nick Layton, who probably had his best game as a V-Red. Hunter Tremblay echoed his coach in basing the difference in the game outcomes on hard work. He offered that his line hasn't been quite executing the last two weeks, but they played better as a unit in this game. Tremblay was also quick to point out that despite the lopsided shooting advantage UNB goalie Derek Yeomans played well, and he had to face some tough shots. Saturday night the Varsity Reds travel east on the Trans-Canada to Moncton to play les Aigles Bleus, while the Panthers stay in Fredericton and play the St. Thomas Tommies. The Varsity Reds avenged an earlier loss to the UPEI Panthers with a 4-1 win on Friday night at the Aitken Centre. Hunter Tremblay led the way with a goal and two assists, while Jordan Clendenning chipped in with a goal and assist. Luke Lynes and Chris Culligan (short handed) scored the other UNB goals. Derek Yeomans made 18 saves for the win as UNB outshot UPEI by a 41-19 margin. The UNB victory combined with the STFX loss leaves UNB in first place in the AUS standings. UNB plays UdeM tomorrow night in Moncton at 7 PM. Bill Hunt provides the game story in Saturday's edition of The Daily Gleaner. Tonight, the AUS #2 ranked V-Reds host the AUS #5 ranked UPEI Panthers at the AUC at 7pm. The V-Reds will look to avenge their season opening loss of 4-2 on the island back on the October 15th. The V-Reds look to build on their three game winning streak and to continue their quest to enter the Nationals in March through the front door as the AUS Champions. Dion Campbell and Hunter Tremblay currently lead the V-Reds with six points each. The Panthers are coming off of a 6-2 win over Dalhousie last weekend and will look to make it two in a row and to once again foil the V-Reds high powered offence. Matt Carter and Matthew Brenton lead UPEI scoring with seven and six points respectively. The game can be seen as a webcast from the SSN website and can be followed on UNBHockey on Twitter . Also, in case you missed it, Bill Hunt catches up with Luke Gallant in today's edition of the Daily Gleaner, make sure you grab a copy. The race is still tight in Week 2 of the AUS Pool. Robert Penney and BruinsFan0877 lead the way for a second straight week with 44 pts, but are being chased by some would-be usurpers. This week's top performer was blackmarketmob with an impressive 23 pts. The Top 10 Standings are listed below, but click the right sidebar link to see the AUS Pool Page for a complete breakdown. Please have a look to see that everything is in order, if you think we've made an error, send us an email and we'll look into it. Big thanks to "Drummer" once again for helping us out this year with the stats.